Marriage announcements can be rich in details for a genealogist. 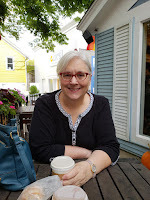 While the announcement below doesn't give a lot of facts that a genealogist likes to find in such announcement, it does give a very nice accounting of the marriage. The writing gives a detailed picture of what the ceremony was like. Now, if I only had a picture of the bride and groom as I have a picture in my head of the bride's dress from this accounting. The article even tells what gift the groom gave the bride, a Knabe Piano. 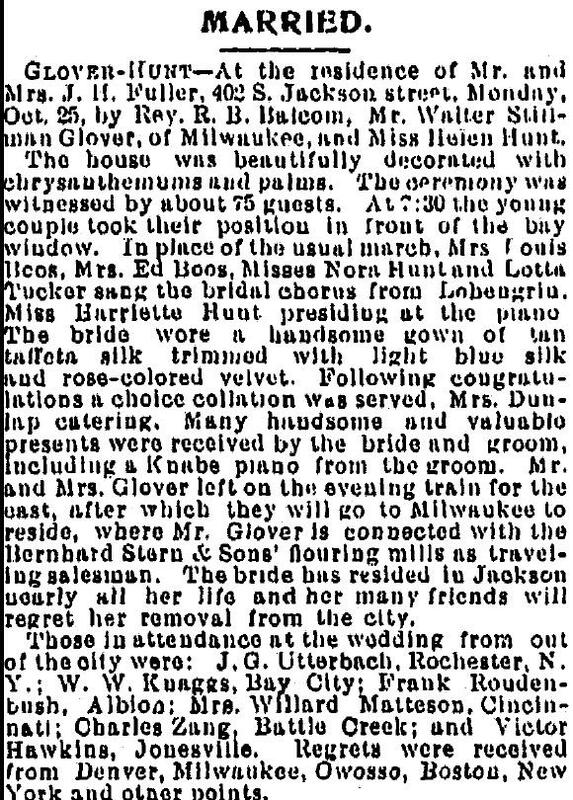 Walter Stillman Glover married Helen Hunt in Jackson, Michigan on 25 October 1897. The ceremony took place at the home of Mr. and Mrs. J. H. Fuller. Further research revealed that Mrs. Fuller was Helen Hunt's mother. Walter Stillman Glover is the youngest son of Samuel Stillman Glover, Jr. and Adaline Dyer, who are my second great grandparents. Source: "Marriage," Jackson Citizen Patriot (Jackson, Michigan), 29 October 1897, Glover-Hunt Marriage Announcement; online images, Genealogy Bank (www.genealogybank.com : accessed 10 March 2013), Historical Newspapers. GLOVER-HUNT-At the residence of Mr. and Mrs. J. H. Fuller, 402 S. Jackson street, Monday, Oct 25, by Rev. R. B. Balcom, Mr. Walter Stillman Glover, of Milwaukee, and Miss Helen Hunt. The house was beautifully decorated with chrysanthemums and palms. The ceremony was witnessed by about 75 guests. At 7:30 the young couple took their position in front of the bay window. In place of the usual march, Mrs. Louis Boos, Mrs. Ed Boos, Misses Nora Hunt and Lotta Tucker sang the bridal chorus from Lohengrin. Miss Harriette Hunt presiding at the piano. The bride wore a handsome gown of tan taffeta silk trimmed with light blue silk and rose-colored velvet. Following congratulations a choice collation was served, Mrs. Dunlap catering. Many handsome and valuable presents were received by the bride and groom, including a Knabe piano from the groom. 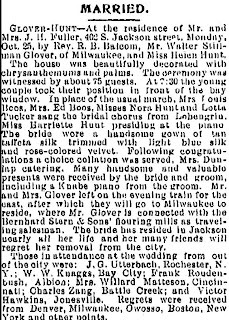 Mr. and Mrs. Glover left on the evening train for the east, after which they will go to Milwaukee to reside, where Mr. Glover is connected with the Bernhard Stern & Sons' flouring mills as traveling salesman. The bride has resided in Jackson nearly all her life and her many friends will regret her removal from the city. Those in attendance at the wedding from out of the city were: J. G. Utterbach, Rochester, N. Y.; W.W. Knaggs, Bay City; Frank Roudentush, Albion; Mrs. Willard Matteson, Cincinati; Charles Zang, Battle Creek; and Victor Hawkins, Jonesville. Regrets were received from Denver, Milwauke, Owosso, Boston, New York and other points.